One of the hottest Hot Spots of North America, Boston was saved from the encroaching seas by a massive civic undertaking, and declared the capital of Atlantica. Now, in the face of riots and acts of terrorism, the American 'Cradle of Liberty' reels under martial law as dissidents protest unpopular decisions in an effort to stoke the flames of rebellion. With soldiers patrolling the streets and violence a way of life, Boston stands poised to either blossom into something greater or be wiped off the map and into oblivion. 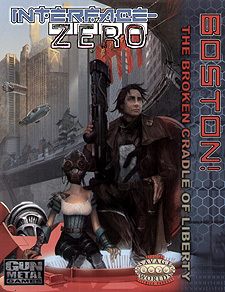 Boston: The Broken Cradle of Liberty has everything you need to take your campaign into the highways and byways of Boston. Whether you're a GM who wants to know what's going on in Beantown, or a player who just wants to hail from the area, you'll have everything you need to know to add Boston to your game. So grab your handy Watchdog and a Molotov Cocktail, tomo, and help decide the direction of the new revolution! Tons of information about Boston, including neighbours, interesting locations and some of the major players of the city. New Edges, Hindrances and Occupations to help give your character that Beantown feel, as well as a whole mess of new gear popular to Boston, courtesy of Malmart. New rules for city Trappings, to help give locations a unique feels. Two complete Savage Tales, and a half-dozen plot hooks to get your Boston campaign rolling. Stats for the important (and some of the not-so-important) characters in Boston. This is an expansion for Interface Zero, and not a stand-alone setting.